At last - some bits and pieces from our 10 days in Portugal. 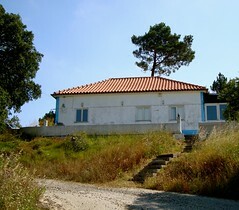 We stayed at Käthes daughter Veronicas house in the little village of Avessada a couple of swedish miles north of Lisbon. Veronica is transforming a piece of barren land around the house into a self sustainable farm. With help of volunteers she has truly accomplished a lot in a very short time. Read more about it here. The village only has some hundred inhabitants but still manages to support 4 bars. This was a good thing since our Internet oriented hosts didn't have a proper TV cable and I really wanted to see some of the world cup games. (Sadly enough - Portugal didn't win any games during our stay.) A beer is only 70 cent or so so it is really affordable to go out and have a beer or a coffee. 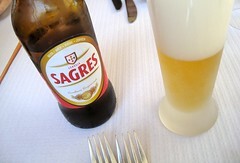 There are two kinds of local beer: Sagres and Superbock. Apparently people lean towards Sagres in the south and Superbock in the north. To me they taste about the same and are really superior to "normal" Swedish beer like Pripps, Spendrups and Norrlands Guld. The coffee is also great and is strong and a bit larger than caffe italiano. Food is great in Portugal. It is perhaps not very fancy but the ingredients are so good that everything just tastes great. We cooked some at home and had some nice lunches and dinners out. Meals to remember were the seafood lunch in beach heaven Ericeira, the buffet lunch on a side street in Sintra with home cooked food by 2 friendly ladies, the very cozy restaurant in Tomar where we sat in a nice homely garden, the sushi at Origami just next to Oceanario in Lisbon, the lunch at a local joint in Malveira (down the hill from Avessada) that were just very local and very good (grilled sardines! ), the brazilian meat dinner in Lisbon and of course a great midsummer's dinner at home with our hosts and some of their friends enjoying (?!) snaps and sill! We did 2 day trips to Lisbon using public transportation to get there and made it to most of the sights and places. Even though I have visited Torre de Belem before it was great to do it together with the kids. Just strolling around in the old parts or Lisbon is also a great time. It is vivid streets where people actually live in the old hoods. 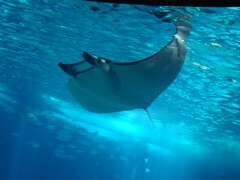 We visited Oceanario which is a huge place with lots of aquariums filled with all kinds of strange and normal fish. There were also a couple of open spaces with birds from different climate zones. The subway station serving Oceanario is called Oriente and has this truly awesome futuristic architecture. Think Star Trek space ship but more voluminous. The weather was a bit interesting. We had some hot days especially in Lisbon and when going inwards from the coast. And we managed to get one great day at the beaches around Ericeira but half way through the coast was about 20 C and misty so we canceled our plans of visiting the bird island outside of Peniche and also didn't make it to surfing school. But we had no problem filling our days with other things to do. One day we stayed at home and only went for a long walk. First up to the hill top with two big wind power stations. It was a strange feeling to look at the great views with 2 rotors moving about somewhere up there. Then we walked around the entire hill (the kids gave up after the hill climb though) finding a couple of geocaches on the way. 2 days were spent in Sintra in the two strange palaces with accompanying gardens from the 19th century. True imagination to come up with all the details in the architecture and a crazy bunch of people to fund it and populate it during the summers. What else? 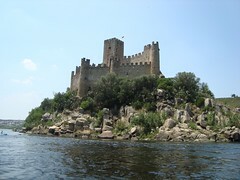 We spent about a day on the templars trail visiting the great Castelo de Almourol in the midst of Rio Tejo and Convento de Christo - the magnificent portuguese templars head quarters on the hills overlooking the nice city of Tomar. All very medieval, terrifying and uplifting. The perhaps saddest part of the trip was our visit to Fatima. I really had to see this sacred place to get a feel for it. The place where a couple of kids saw Mary and people started going there en masse despite the church initial attempts to marginalize it. It was fascinating to see the big square between the two churches in memory of the event. There is a special lane for people walking on their knees to make God listen better. Being a former newborn it is always depressing to see religion having so much power over people. Maybe it is good for some of them but I am sure that for many it is rather a limiting force. 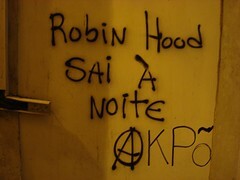 And the graffiti was great. As always - a good guide book (Lonely Planet this time) is really useful and we had good luck with restaurants we tried outside the text. Just look for the locals is as good an advice as ever. There are more pictures over at flickr if you just can't get enough! And superthanks to Veronica and Alexander for having us!